Windy with rain showers early with clear skies overnight. Low 36F. NNW winds at 20 to 30 mph, decreasing to 10 to 15 mph. Chance of rain 40%. Higher wind gusts possible..
Windy with rain showers early with clear skies overnight. Low 36F. NNW winds at 20 to 30 mph, decreasing to 10 to 15 mph. Chance of rain 40%. Higher wind gusts possible. Belted Galloways resting along a tree line. Belted Galloway heifer with calf. Belted Galloways lined up in field. They’re the “oreo cookie” cow of the bovine world, and they are a unique breed among cattle. Belted Galloways have the continuous white belt encircling their middles, with the rest of them being primarily black, although they can be red or dun. The “belties,” as they are referred to, are a smaller animal that originated in the Galloway district of Scotland. References to the “sheeted” cattle can be found in literature and art as early as the 11th century, but the belties’ first recorded history is from the 15th century, in an area of Scotland known for its rugged and hilly seacoast. Belties have a more moderate frame, as compared to the more well-known breeds, are more rugged, more feed-efficient, and more tasty, says Victor Eggleston, DVM, the executive director for the Belted Galloway Society. The animals have hair coats four times thicker than standard beef animals, with two layers. The outer layer sheds in the summer to help the cattle adjust to the heat. In cold weather, the two coats are an advantage. Most beef animals need additional feed to maintain their body heat, but belties, because of their heavy hair coat, don’t. “They don’t require as much fat to insulate themselves,” Eggleston said. Belties are also very efficient feeders. Eggleston has talked to commercial feeders who also have belties, and when feeding forage, belties are 30 percent to 40 percent more efficient than the commercial animals. Greg and Pat Hipple have two herds of cattle outside Solon, Iowa, an Angus-based commercial herd and belties. He keeps the two herds separate till the fall, when calves are weaned and the cows are brought closer to home. It’s then he notices a big difference: the belties eat about half to 60 percent of the feed that the commercial herd consumes. Of course, the belties wean smaller calves, anywhere from 550 to 700 pounds, and when a beltie steer is ready for slaughter, it will weigh about 1,250 pounds. Many Belted Galloway producers market beltie meat directly to the consumer. There’s less waste, because of less fat. Hipple notes his belties have about a 2 percent higher carcass yield than standard cattle. Belties gain on less feed, even if their rate of gain isn’t as good. Hipple’s best rate of gain for his belties has been 2.9 pounds. “The cattle are a little bit thriftier than commercial cattle,” he said. The animal’s smaller carcass also works well for today’s smaller families. The Hipples market their meat in halves and quarters, all by word of mouth. One of their clients is a restaurant in Solon, the Salt Fork Kitchen. The chefs were initially looking for something unique when they approached the Hipples. They served belties produced by the Hipples, but once, Greg took in a black white-faced steer that was well-finished. The chefs told him, “there’s nothing wrong with that beef, but we don’t want it again.” They preferred the taste of the Belted Galloway. Patrons of the Salt Fork Kitchen who have eaten the beef and asked about it have been referred to the Hipples. “We’ve had people buying beef from us for 20 years,” Hipple said. 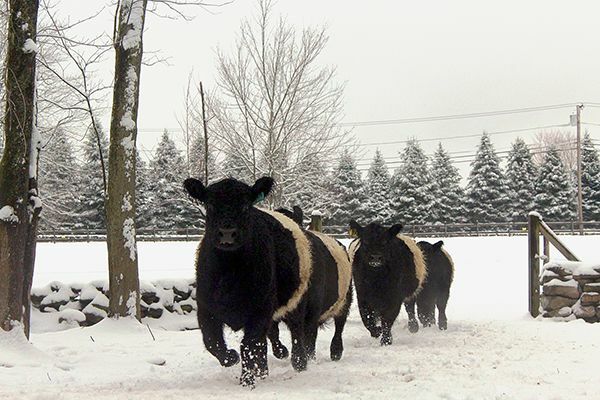 The national association for the breed is the Belted Galloway Society, with headquarters in New Glarus, Wis. Associations can also be found in Canada, Australia, the U.K. and Ireland, Germany, Norway, Denmark and New Zealand. 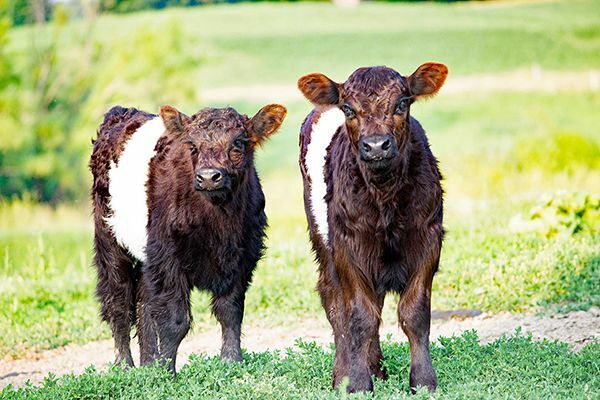 The Hipples got their start in belties like most others: because of the animals’ unique look. When they were dating, they would drive past a farm with belties, and Pat mentioned she would like some of those black and white cows. They bought one in 1993, and when their two kids came along, they showed belties. Greg, a past president of the association (2016-2017) and Pat have loved the people they have met through association meetings. But it’s still the unique look that attracts people. “They’re eye-catching. That’s what puts people on them from the beginning,” Eggleston said. Winston Churchill owned a herd of belties and was a member of the Belted Galloway Society in the U.K.